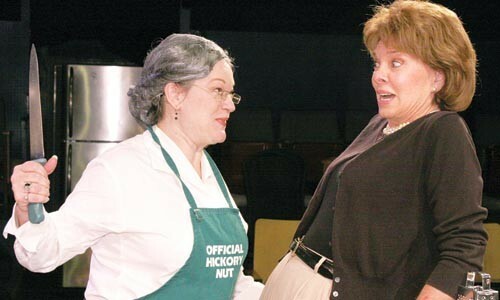 Cut-ups: Lynne Franks (left) and Lynne Martin-Huber in Little Lake's Kitchen Witches. 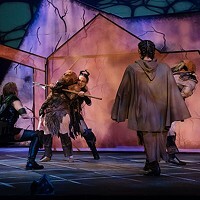 Dramatic license extends only so far: It is revoked when muddling the facts is unnecessary for story flow or effect, and instead merely reflects the sloppiness of the playwright. 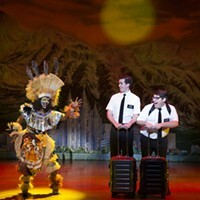 Character credibility is not a major issue for the Little Lake Theatre Co. production of this 2003 Canadian comedy, newly larded with local references. Quick wordplay and lots of very physical "business" for two seasoned actresses are the main attractions. Yes, there are many culinary puns, with generous sprinklings of insult humor and double entendres, and a soupçon of questionable taste in the racial-joke department. The thin premise is that two newly unemployed cooking-show hostesses -- once close friends but bitter enemies for nigh onto 30 years -- have a second chance at small-screen glory if they become a team. As the script puts it, the two combine "Martha Stewart and Jerry Springer," the "favorite programs" of the wife of the station manager. Though they begin with recipes, episodes of their community-access television show, The Kitchen Witches, always devolve into more bickering than baking, with embarrassing revelations from their pasts. For Little Lake, it's the Battle of the Lynnes: Franks and Martin-Huber, doyennes of the community theater. The former embodies the cushiony Dolly, the "regular-folks" long-time housewife and mother with an earthy (i.e. over-sexed) sense of humor. This contrasts nicely with the latter's sharply sophisticated Isobel, a Cordon Bleu-trained career woman. Both characters are drama queens, and the actresses jump in with both feet, not to mention hand slaps and hair pulls when the slapstick starts. Ethan McCarty manfully fulfills the thankless role of TV director/son trying to keep the show afloat, and the two "cooks" from killing each other. Director Jena Oberg and her crew have bitten off a big job, with a working-kitchen set (applause for designer Martha Bell and tech director Robert Fitchett, who doubles as Rob the Camera Guy) and extensive scene changes (more applause for stage manager Victoria Bennett, assistants Becky and Josen Mitchell, and props manager Leigh Ann Frohnapfel), while the Mses. Franks and Martin-Huber gleefully chew the scenery.